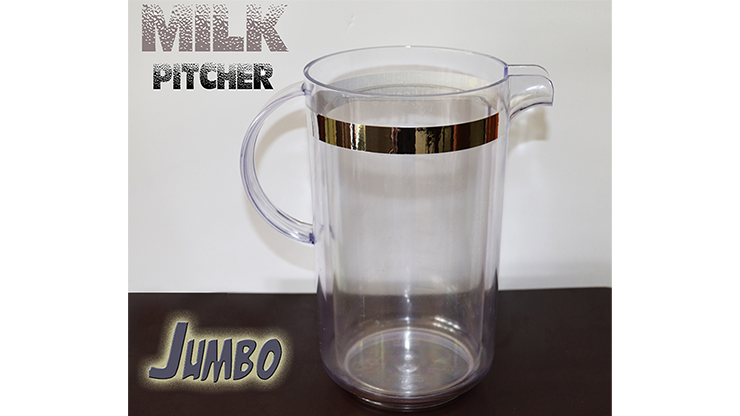 Today, when you order "Milk Pitcher Jumbo (Deluxe) by Amazo Magic", you'll instantly be emailed a Penguin Magic gift certificate. You can spend it on anything you like at Penguin, just like cash. Just complete your order as normal, and within seconds you'll get an email with your gift certificate. Here we present a large pitcher for the classic milk effect. Pour milk into a borrowed newspaper or a folded paper cone, and the milk vanishes! It is a large-sized pitcher, with sections completely removable for perfect washing. There is no glue or sucking device inside it. A silver band on the top makes it elegant and sparkling. High quality plastic measuring 18 cm wide and 20 cm in height.